8 Fiber MTP®/MPO to LC Breakout Cable: OM4 MPO to 8xLC Simplex fiber breakout assembly. 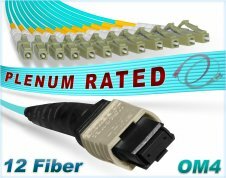 QSFP MPO/MTP multi-fiber, OFNP Plenum Rated, high density, connection distributes to 8 Simplex LC fiber connectors, each with 2.0mm OD, aqua colored, jacket. Ceramic ferrule LC fiber optic connectors terminated to Corning OM4 50/125, Laser-Optimized Multimode Fiber (LOMMF), 100Gb Rated Fiber Cores. Compatibility MTP® Compatible MPO Connector - MTP® (Multi-fiber Termination Push-on), is a registered trademark of US Conec. Connector 2 8 LC Simplex, 1.25mm form factor, ceramic ferrule, connectors. OM4 MPO/MTP® to LC 8 Multi-fiber distribution breakout assembly, Plenum Rated OFNP 100Gb Multimode 50/125 Corning optical fiber cores/cladding. Connector 1 is terminated with a MTP® Compatible MPO multi-fiber push-on style contact connection. Connector 2 in terminated with 8, ceramic ferrule, LC style fiber optic cable connectors. Lc Simplex contacts have a 1.25mm ceramic ferrule for optimal fiber core alignment and reliable connectivity in a small form factor housing that's compact and easy to manage in high density cable environments. Having 8 individual LC Simplex connectors is the equivalent of 4 Duplex fiber connectors. A QSFP MPO/MTP multi-fiber connector has 8 x 50/125 fiber cores that breakout into 8 individual simplex fiber patch cords at the other end of the 8 fiber distribution assembly. Each Aqua colored, 18 inch, Simplex breakout cord has a 2.0mm outer diameter jacket. Each fiber optic cable assembly ordered from FiberCablesDirect is individually tested and bagged with test results inside. We also provide a Lifetime warranty on all our products. Orders for Om4 MPO to LC 8 Fiber breakout/fanout cables above 35 meters may require an additional 1 to 2 days to ship depending on the quantity ordered. However, most orders ship within 24 hours or less. Quality Control: Fully tested by qualified technicians and test results shipped with product. Warranty: This MTP/MPO to 8xLC breakout cable comes with a Lifetime warranty. 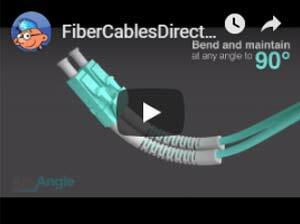 Lengths available in our online catalog for Om4 MTP/MPO to 8xLC fiber breakouts: 0.5 Meter, 1 Meter, 2 Meter, 3 Meter, 4 Meter, 5 Meter, 6 Meter, 7 Meter, 8 Meter, 9 Meter, 10 Meter, 12 Meter, 15 Meter, 20 Meter, 25 Meter, 30 Meter, 35 Meter, 40 Meter, 45 Meter, 50 Meter, 55 Meter, 60 Meter, 65 Meter, 70 Meter, 75 Meter, 80 Meter, 85 Meter, 90 Meter, 95 Meter, 100 Meter, 125 Meter, 150 Meter, 200 Meter, 250 Meter, and 300 Meter.